Chhatrapati Shivaji Terminus (formerly Victoria Terminus) is a 19th century railway station in Mumbai, that is known for its architectural mix of Victorian Gothic Revival and traditional Indian features. 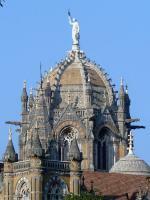 It is a symbol of the blossom period of Mumbai as a commercial city in the late 19th century. The station was opened in 1887, on the Silver Jubilee of Empress Victoria. Its architect was Frederick William Stevens, who implemented advanced structural and technical solutions. He designed it in the Gothic Revival style. This essentially Italian style has many similarities to traditional Indian palace architecture, such as the use of turrets, colouring and ground plan. 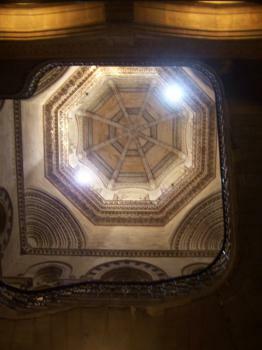 The building's major focal point is its octagonal central dome. The station was originally named "Victoria Terminus". In 1996, in response to demands by the Shiv Sena and in keeping with the policy of renaming locations with Indian names, the station was renamed by the state government after Chhatrapati Shivaji, a famed 17th century Maratha king. Mumbai is an enormous city that suffers from heavy traffic most of the day. Its main train station is located at a busy intersection in the very center of the city. The Chhatrapati Shivaji Terminus is THE highlight among the city's historic buildings. And still a working railway station. From across the street one can admire all its quirky ornaments. We also went to have a look at the inside of the station. Unfortunately we only could get in to the part where the tickets are sold and the trains leave. The best part of the building (under the huge dome) is off limits to visitors. I tried to have a closer look, but was sent away by a guard. I guess it is used as a railway office now? The exterior of the station did remind me of another WHS, Barcelona's Hospital de Sant Pau - the use of turrets, the colouring. It undoubtedly is a great work of period architecture, but I was a bit disappointed about the visit in general (mainly at the limited possibilities to admire the interior). 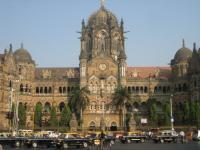 At the heart of Mumbai is the Chhatrapati Shivaji Terminus or more popularly known as Victoria Terminus. Inscribed as a UNESCO World Heritage Site in 2004, Victoria Terminus is currently the headquarter of the city’s Central Railway System. The building was designed by Frederick William Stevens inspired by the concept of Victorian Italianate Gothic Revival architecture. At the same time, it was meant to have some similarities with Indian Goth architecture. The terminus is still functional, and to date, it is one of the busiest railway stations in the entire sub-continent of India. The Victoria Terminus serves as a terminal for both long-distance trains and commuter trains. Two options to visit the terminus: public transportation (obviously, it is an easy access because it is the central station) and on a private tour. For this trip, I was on a private tour provided by my hotel. There is a different kind of order inside this marvelous piece of architecture. I mean, the city is not different from my experience with Manila in terms of crowd and chaos. But inside the station, despite sporadic noises (from the announcing speakers, footsteps and noise from the coming and leaving trains), there is a sense of order – a sort of “chaotic” order where the physical bodies of commuters become one with the artwork. I only had a few days to explore Mumbai. I will definitely go back in the next few years and explore more of its Indo-Saracenic architectural charm via the new inscribed properties. I have written a detailed narrative (including some photo-essays) about my experience at the Victoria Terminus in my personal blog, available here. I visited this WHS in November 2016. Apart from having railways as WHS, India also has a railway station inscribed on the WH list. That said, what is surprising is not the Terminus's inscription but actually that it is indeed a railway station with some of the most unique railway head offices worldwide. It is possible to visit the interior of this Victorian Gothic building either simply by accessing the railway station entrance itself or else by booking a Heritage Tour (Monday to Friday, 3-6pm) at the Heritage Museum (ticket issuing time 3-5pm). This tour not only grants access to the museum at the ground floor but will enable you to view the interior and central dome from the viewing gallery on the 1st floor and the Heritage Lounge on the 2nd floor, apart from a quick peek of the forecourt at ground floor. If you have the time by all means, even though the absolute highlight and OUV of this WHS lies in its magnificent exterior. Viewing the huge building's exterior can prove quite tricky at times. The rear and lateral parts (station entrance and bus terminus) are quite straightforward to visit and will provide good opportunities to appreciate the different sculptures and architecture. There are 3-4 brass UNESCO plaques proudly displaying Victoria Terminus's inscription as well as a touristy "A UNESCO World Heritage Site" sign on the main gate and facade. 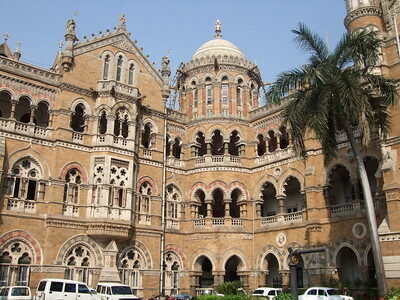 However, the best view of the facade and central dome lies opposite just near the traffic lights in front of the Municipal Corporation Building of Mumbai (known as the BMC). 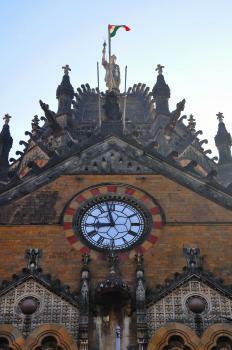 By the way, this building is also worth viewing and is like a continuation of the CST. Best time to visit this spot for photography is in the afternoon as in the morning you'll only be able to see dark silhouettes of the CST. Getting there though involves a walk round the block from one traffic light to the next. In general, Mumbai was a very pleasant surprise as it has much more charm and well-kept colonial buildings than for example New Delhi and it does not suffer from frequent fog/smog problems like the capital city. Now that I visited both cities, I think I'd choose Mumbai over New Delhi for any short layover I might have in the future. If you want to see this building fully lit, do visit at night time or during the Diwali Festival and you won't regret it. In one Saturday morning I decided to do a city walk, from the Gateway of India to Chhatrapati Shivaji Terminus, to discover Mumbai's colonial heritages in the historic area as well as one World Heritage Site and two sites in the tentative list, colonial and art nouveau buildings around Oval Maidan and Churchgate Station. I was fascinated by the sheer size and amount of colonial buildings built in Indo-Saracenic style especially at Bombay University and the High Court, and deeply moved by the gorgeous Georgian square at Horniman Circle, no wonder if the city of Mumbai wants to nominate its colonial heritages to be World Heritage Site. I walked under European style covered walkway along Dr. D Naoroji Road, where many grand but crumbling palatial mansions located, to reach my destination, Chhatrapati Shivaji Terminus or simply called CST. 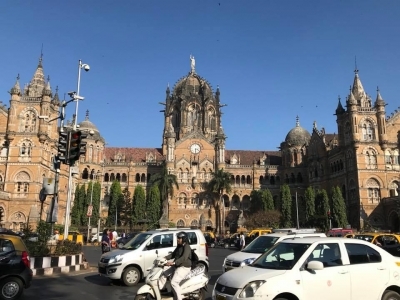 My first sight on the terminus was not exactly grand as I expected because the main entrance of the terminus did not face the main square, and the grayish but eye catching post office building and impressively Indo Saracenic building of Mumbai Municipal office stunned me instead. I walked around the square trying to find nice angle to take good photo, but I really did come a wrong time, as the sun was directly behind the building. I entered into the pedestrian tunnel to reach the terminus. I walked around the chaotic building with thousands of commuters, not a nice experience at all. I saw the ticket area to admire nice gothic ceiling that should be in cathedral more than railway station. Then I saw a board informing that Indian Railways had heritage tour to see the building interior on every weekday afternoon, but since I visited on a very bad time, Saturday morning so no chance for me to see interior or take a nice photo, better to come on weekday afternoon. I decided to walk around the building again and found the front gate was opening so I asked the guards to go inside the courtyard area which they were happily allowed me. In the courtyard I saw the World Heritage plaque, and much peaceful time to admire building façade details. I really admired the octagonal dome with its height and complicated design like crown. After that I walked to Azad Maidan to see Churchgate station which is an extension of CST in the tentative list. I was surprised that Churchgate station was a new modern building. The Churchgate in the tentative list was the Western Railway HQ Building on the opposite side of the road. Since the building was an office so no chance to see the interior, but for the exterior I had to say the CST was grander in style and size. The style of Churchgate was quite united with other Victorian buildings around Oval Maidan as typical Indo Saracenic building style. I was not sure why Churchgate has been nominated as an extension project since I did not see its merit, and because Churchgate is located next to Oval Maidan, I believe it should technically be part of Mumbai colonial and art nouveau buildings nomination. Anyway I happily ended my city tour at a Persian restaurant at lunchtime, a fine half day in this chaotic city. I love travelling by train, and I also have a love of architecture; as such entering train stations is always a special sensation for me. I decided to throw myself in at the deep end with this site, and booked myself onto a sleeper-train on my first night in India. I therefore had to rely on VT as my base during my first taste of the country. I was delighted to be dropped of from the airport at a place that seemed incredibly familiar to me, not only because I have seen so many pictures of it but also because it looks like it could be in London. The comparison with St Pancras is very obvious, VT is obviously used much more frequently and has loads of character, this has led to the dull/ ugly extension to the station, and the main shed is nowhere near as awesome as the magnificently restored example at St Pancras. However VT has a massive buzz and energy about it. I really enjoyed going to the food stall and ordering a masala dosa, (perhaps my favourite meal in the world) getting change from €0.40 and elbowing my way to a counter top to tuck in. It was also fun to walk up to the bridge over the commuter trains and watch them decant an astronomical amount of people into the station, happy with the knowledge that I wasn’t caught up in the rush. The whole fort area of Mumbai was littered with buildings that could just as easily be in London, and sitting down to watch innumerable games of cricket, it was only the intense heat and extra amounts of litter that alerted me to the fact I wasn’t at home. After negotiating my way onto an overnight train (the hassle of the reservation lists etc.) and then returning the next night I was left with a much quieter experience of VT as Saturdays are nowhere near as busy. This enabled me to casually sneak into the main entrance and get a view of the wonderful staircase and dome, which both Els and Paul were denied a view of. I was quickly asked to leave, and the guns of the man asking indicated that I was perhaps a little naive to walk into a restricted zone, however I have very fond memories of seeing the interior of this wonderful building. I really liked Mumbai, it was a great introduction to India for me. I am exceptionally happy that I was not only able to view this charming station but was able to use it for its main purpose of travelling out on its wonderful train system. Our previous visit to Victoria Terminus had been from the “business-end” – arriving on an overnight train from Aurangabad in 1996. The site wasn’t WHS-inscribed at the time and we were more concerned with the logistics of an unplanned early morning arrival into teeming Bombay (getting a taxi, finding a hotel etc) than in admiring the architecture – although its general grandeur was noticed as we passed through!! So, on our first return since its inscription in 2004, we made a special visit to see what we might have missed. As other reviewers have noted, there is not a great deal to see beyond the exterior. The original Booking Hall, known as “The Star Chamber” because of its marble gothic columns and archways, is impressive but, in all honesty, seemed to us a bit “small” in comparison with the size and importance of the entire structure. Of course Indian railways and their passenger numbers have grown significantly since the original station was started in. 1878 Originally the station was built with just 4 (or 5?) platforms and another station (not within the inscribed area) was built alongside in 1929 with another 12 or so. Today this “new” station handles long distance trains with the “old” station and its booking office handling suburban commuter services. Beyond the booking hall the platform and concourse areas behind the main building still contain some fine wrought iron work. Otherwise one can only try to pick up the detail of the exterior decoration (Photo). The Indian references and their inclusion in an overall Indo-Saracenic style are after all what makes this station different from other Italian Gothic structures elsewhere in the World. British visitors will always be reminded of London’s St Pancras Station of course and the Nomination File includes numerous sections on why Victoria Terminus is superior to/different from it.. The main entrance from Victorian days is now securely guarded and leads only to the railway offices past several signs advertising the site’s WHS status and some attractive gardens. One can only guess at what lies beyond – the nomination file provides a few glimpses of e.g a massive “Banqueting Hall” (originally the “Waiting room”) and the staircase with a wonderful view up into the Dome. It also states that the building, originally designed for 680 users, now contains 1800 (The building was always designed both as a station and as the Head Office of the Railway Company)! Mention is made of corridors having been taken over as work areas - and there is a wonderful photo of a number of clerks sitting at a desk which itself contains a pile of papers, but is overshadowed by a mountain of files reaching to the ceiling behind. This is described as an example of a “fire hazard”!! The nomination file includes a massive section concerning the amount of conservation and restoration which needs to be carried out – so much that one is slightly surprised that ICOMOS/UNESCO didn’t require at least some of it to be completed before inscription. But so many Indian Nomination files contain fine expositions of what needs to be done and relatively little about what has already been accomplished! One future plan shows a Visitors’ Entrance, an Information Centre and Cafés (indoor and outdoor!!) Finally there are to be a Railway Museum and Archive Library!! One suspects that these will remain an unfulfilled “dream” for many years – until then one just has to be satisfied with the glimpses on view. An active cummuting hub; a passage for millions of passengers everyday; How many of them know they are just inside a world heritage monument? tarry a moment and appreciate the friezes and gargoyles! V.T. station, it's great example of British construction as a strong & beautiful building. Daily I'm watching this building and it look more attractive. Every day I'm trying to find something un-seen facts in it. I feel proud to be apart of Mumbai where is building is located. My first job was at Mumbai after completing college in South India. I took the train to Bombay and reached "VT" (Victoria Terminus) as it was called then. The sheer hectic activity of the city in the train station built in the Victorian architectural style is still fresh in my memory! WONDERFUL!! Unibelievable. It's enormous, probably the busiest railway station in the world. A lot of Bombay, is still undiscovered. I hope the government starts maintaining the heritage buildings soon. Bombay should be restored to it's original, as the britishers made it. Mumbai of today is a bustling 20-million people megacity. It is as charming as charismatic. It’s India’s past, present and future mixed into one overpopulated, irrepressibly vibrant whole. The British heritage is strong in Mumbai. The first economic boom came during the American Civil War and Mumbai then took the chance to take over as the worlds main supplier of cotton. An economic boom followed and a building frenzy started in Mumbai resulting in many Victorian styled houses and palaces. Walking around the Colaba district on the southern tip of the city, sometimes feels like being in a tropical London. The true jewel in the architectural Crown is the Gothic styled Chhatrapati Shivaij Terminus, formerly Victoria Terminus – the central train station. It looks more like a decorated palace or a cathedral than something as mundane as a transport depot. The station is considered to be the most beautiful train station in the world as was designed and completed in 1887 by Frederick Stevens, who carefully studied European train station before starting up his project. You can also clearly see that the station draws quite a lot of inspiration from St Pancras in London. Today the station houses the HQ of the Central Railways and is one of the busiest stations in India. Approx 2 million people pass through the station each day and it is a hub for both local suburban trains and a long distance trains. If your destination is Mumbai, make sure to allow some extra time to check out one of the most grandeur train stations in the world. I know about the troubles for indian government to keep clean railway stations. Perhaps UNESCO could help in the case of W. H. places like this one. I am for it. It's difficult to me to talk about the historic and artistic qualities of a place if the place is not clean enough. The Victoria Terminus (now Chhatrapati Shivaji Terminus), for an Indian who loves and studies Mumbai, is an edifice of the colonial blend of Victorian Gothic with Indian overtones. The Peacock "JALI", the Pillar-decorations that show Indian animals eating Indian fruit, the faces/busts of Indian social/economic leaders and also British officials... all tell a story! Re the changed name, one may point to the omni-presence of "Victoria" in the British-ruled "Bombay" : there was Victoria Gardens, Victoria Jubilie Technical institute, even the horse-cart was (and is) called "Victoria". It's great to see this wonderful old building added to the list. To me, it is the symbol of Bombay. I just wish they'd get rid of the overly politically correct modern name. All of the lccals I have ever spoken to call it VT or Victoria Terminus. 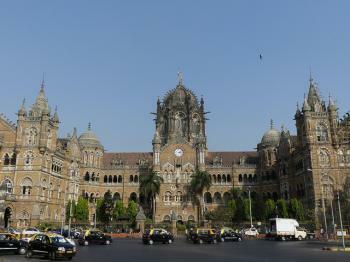 Queen Victoria: WHS is officially titled "Chhatrapati Shivaji Terminus (formerly Victoria Terminus)". It had been renamed in 1996.